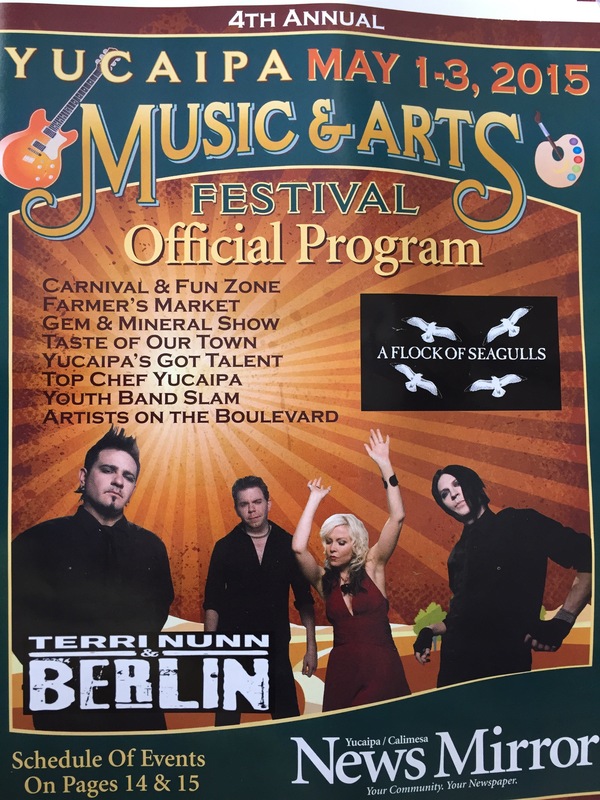 The Yucaipa music and arts festival will come to an end today. Thank you for all those who came out to support. 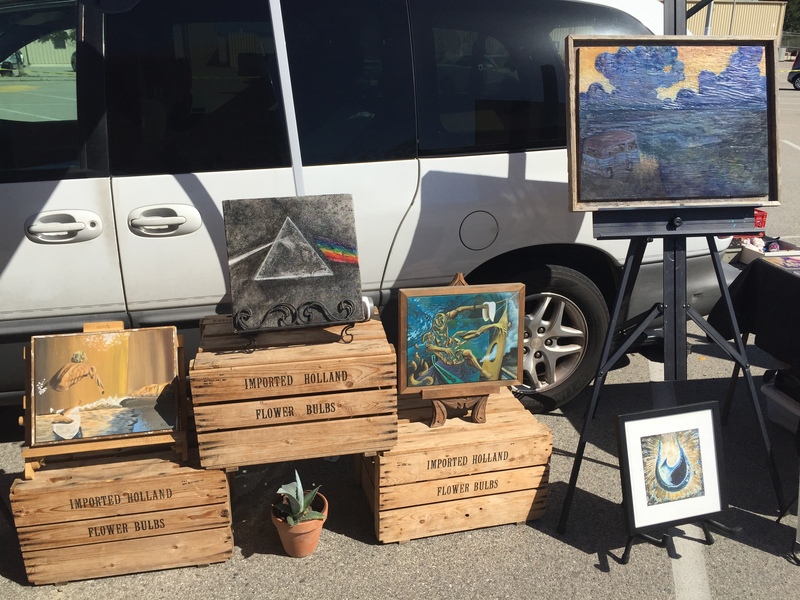 You still have time to paint on the VW bus and check out all the great art that Yucaipa has to offer. Come down and take part in the festivities and support your local artists. Thanks Dillon! Great to meet you and your family. I will post the second image later. Artwork is sold as set. Or, come up to the arts and music fest in Yucaipa, and see it for yourself! Noon to 7, Yucaipa Blvd. just past California St. Locked but not loaded, yet. The booth is ready for ammunition. Drawings and paintings will be hung in the morning. Sales start at 11am, so you’ll be able to get your Saturday lie in. Flock of Seagulls are on at 7:30pm, and Berlin follow at 8:30. That gives a good window for enjoying Yucaipa’s old town, and supporting local artists and local business. Yucaipa arts and music festival. The fest starts tonight. What are you doing this weekend? Cruise out to Yucaipa and join in the festivities. 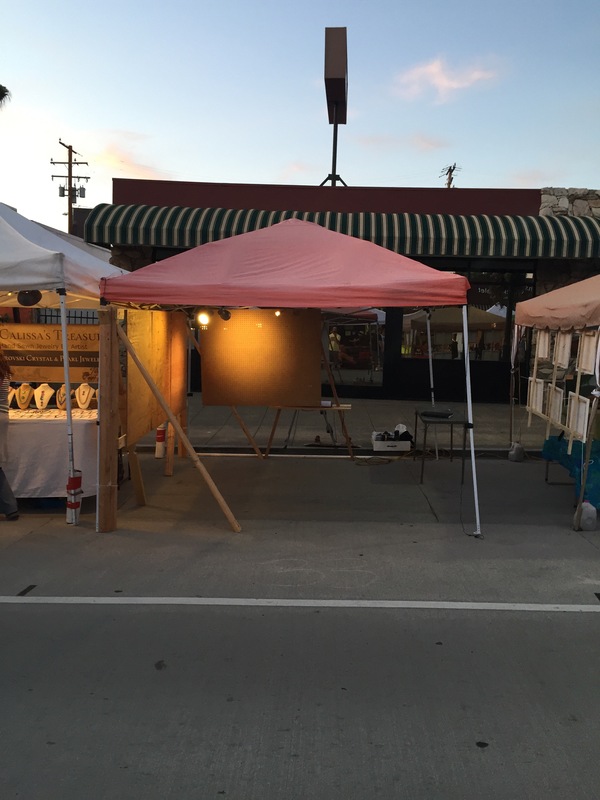 Artist row is located just past California St. On Yucaipa blvd. But that’s not all that’s going on. Good times and great oldies all weekend long. See you there! I found a box of blank greeting cards in my “Mary Poppings bag”, so I decided to challenge myself and draw on one everyday. They will be for sale at the Yucaipa Arts and Music festival this weekend. All cards will be original drawings. We will be set up Friday evening and be open for business until closing time on Sunday. Cruise on through! Orbitals light a soft path. A hard line divides. Crashing, repeatedly; sleeeeeeep. What an absurdly beautiful day today at the Saddleback vintage market. We would like to give thanks to everyone for coming out and all the love given to Theostyle’s art and Vinylly Found. Especially Jeff, Eric, Doc, Denise, Chris and fam, Mat and his lady, even the European guy that was haggling over a dollar record. The records were torn through upside down and inside out but hopefully they received great homes. Next on the schedule is the Yucaipa arts festival, the weekend of May 2nd. Details to be posted in the near future. We are going to need a few months to rebuild the collection back up. Until the meantime I would like to dedicate this track to Jeff from San Clemente for suggesting I play this album today, Claudia from Rancho who bought the album (and many others), and the gentlemen who straight up thanked me for playing this song, “real music”, at our booth. This was by far the the track/album of the day. Enjoy! We will be selling records and of course the one and only Theostyle paintings, drawings, anything and everything theostyle. For all you newcomers take a look around to get a taste of what you will feast your eyes upon next weekend.Theo will be doing a live painting which will be auctioned off via ebay. Just search for vinylly found on ebay to find it or check back later in the week for a link to the ebay posting. We will be posting pictures as it progresses. Auction will end at 3. Don’t miss your chance to get a theoriginal. We will have a deep collection of records curated by the Vinylly Found team which will range from classic rock to jazz to soul to everything in between. There will be $1 bins, $3 bins, and individually priced records. Mention VINYLLY FOUND and get a free $1 record while supplies last. We will see you all next weekend, until then enjoy a gem from the giants Eddie Harris & Les McCann. We will have this record on hand and more!! Art from Icon Series. Yucaipa. 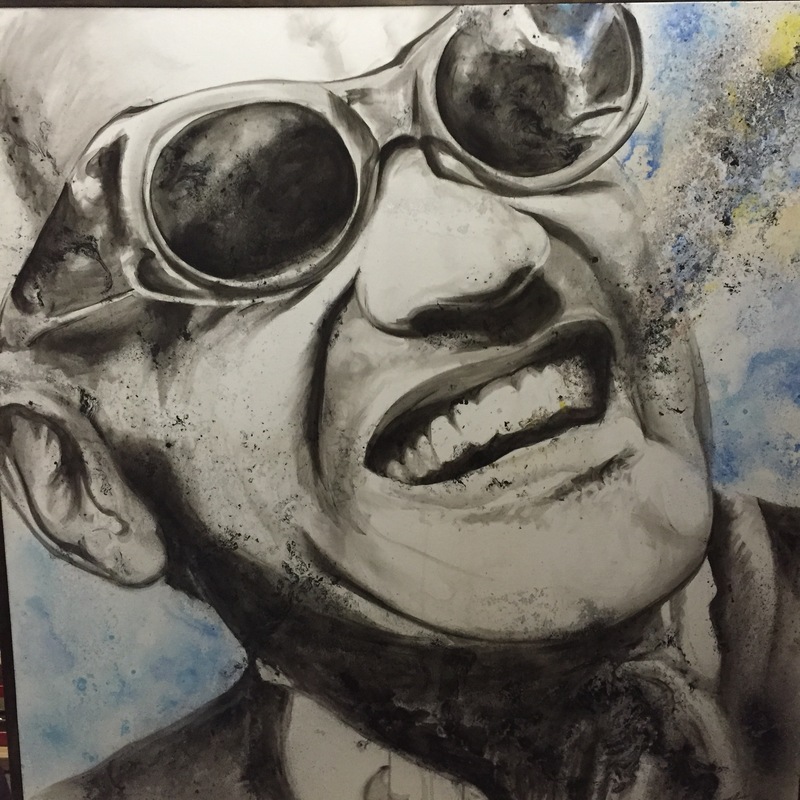 5 paintings from the icon series are now up for viewing at the Queen Bean in Yucaipa. My first show in my new home town! The works will be up until Sunday November 30th. If you are in the neighborhood and want a good place to stop, relax, and refuel; The Queen Bean is the spot to be. 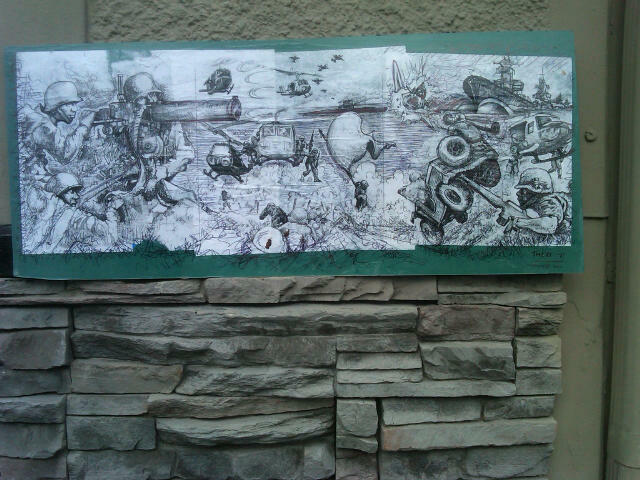 You can always find Art on the brick wall, tasty grub, comforting beverages, and good people. Thank you to all those who came by our booth this weekend. We made many new contacts, friends and got much love and appreciation for all the art that was on display. The website will be slowly emerging throughout the next couple of months so keep checking back to stay in tune. Thanks again, Yucaipa, for making us feel at home in our new town. See you at the next art show! 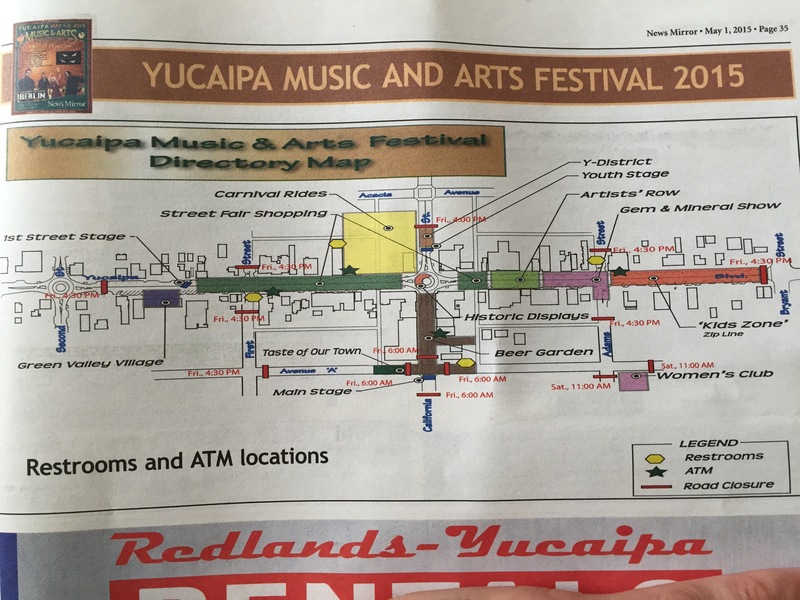 Come up, or down, to the Yucaipa Music and Arts Festival, this weekend. I will have my art on display on 1st street along with other local artist. Come visit, listen to music, check out some art, eat good food, or have some cold ones. See you there! Don and Theo’s Flippin’ art show. Fullerton art walk is always good times and great oldies. Hope to see you next time. Come on down and check out our Flippin’ art show. Should be fun. Live Painting. Frevelry 2012 @ rG. 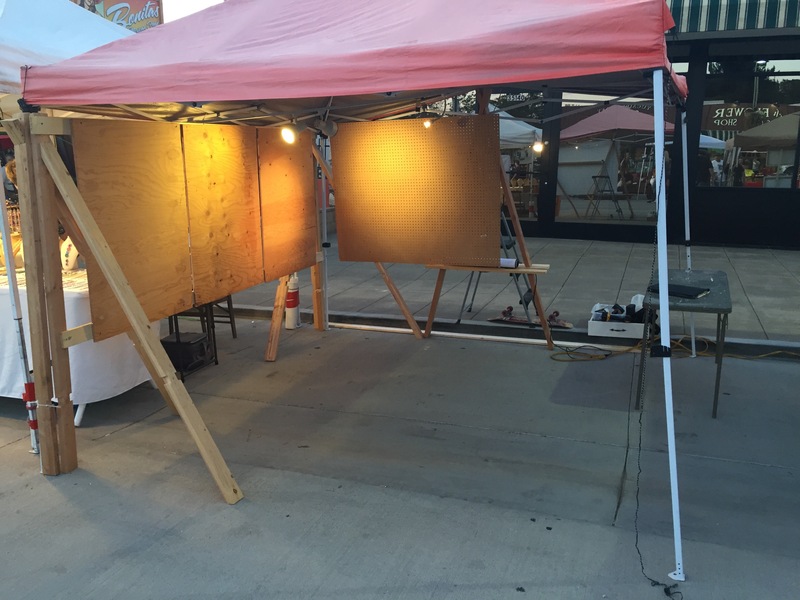 I will painting live on and off throughout the evening, beneath an 8 x 24 ft. mural. There will be some small pieces hung, music, refreshments and a very enjoyable crowd. Come on down to Related Grey in Brea. See you soon! Please join us for ENDLESSSUMMER event at Hairajuku Salon in Rancho Cucamonga. Check back soon for more info. I was involved in the March 2 year anniversary of the Fullerton Art walk. 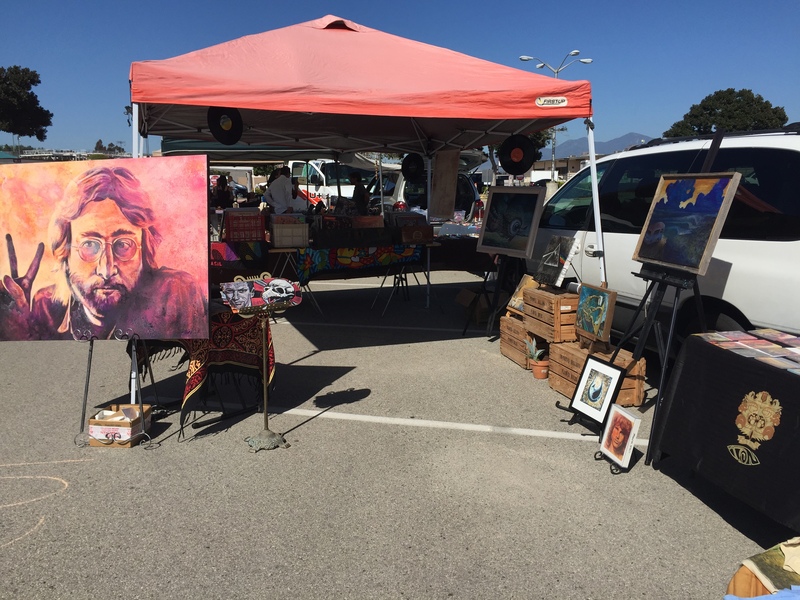 It was an outdoor event with many Fullerton local artists showing off their stuff. I was fortunate to meet some new art lovers as well as see some old friends. 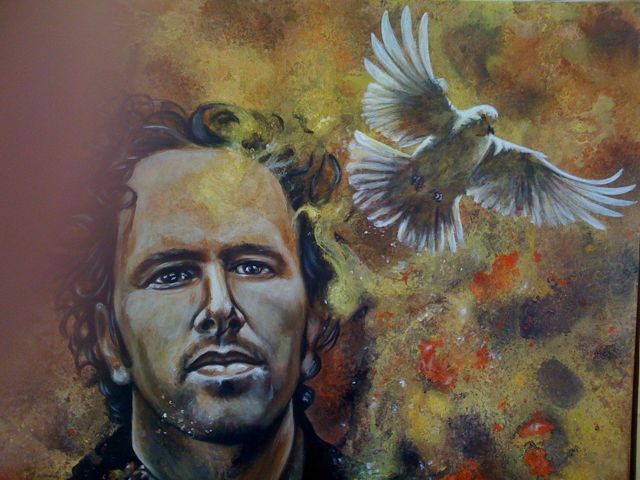 Thank you to all who were able to show their love for the arts. Here is a peek at the Theostyle booth. (Handmade, no hardware, A-frames… Thanks Pops!) Newest small framed pieces now on display at Hairajuku Salon in Rancho Cucamonga. Tags:community, past art show, Thanks! The JERR by Warren Heard NOW Available. Check out this little art show down at P.B. If you were there… you might be on camera! Pacific Beach Surf Shop by My Local Lineup TV from My Local Lineup on Vimeo. It’s that time again! Hair A Juku Salon’s annual Art show. For those of you that missed our last one it was a great time. 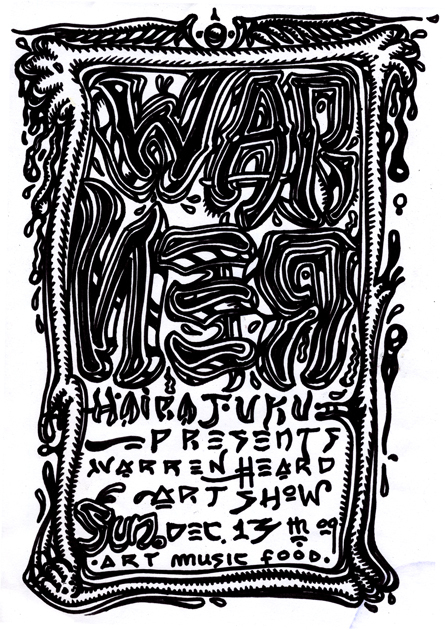 Please join us in celebrating an amazing artist Warren Heard Sunday December 13th at 7pm-12am. It will be an evening of the arts, live music, Hors d’oeuvres, Spirits, and great company. For those of you who haven’t had the pleasure of visiting Hair A Juku salon yet we are located at 12365 Foothill Blvd Suite #104 Rancho Cucamonga Ca 91739. We are across from Victoria Gardens Behind El Torito & Total Wine. For more info or directions please feel free to give us a call 909.463.3439. I will be having an open house at my studio on Saturday, June 13th, from noon until 9pm. There will be many other studios and galleries open and having shows in the area. I will also be participating in 2 other shows on saturday. 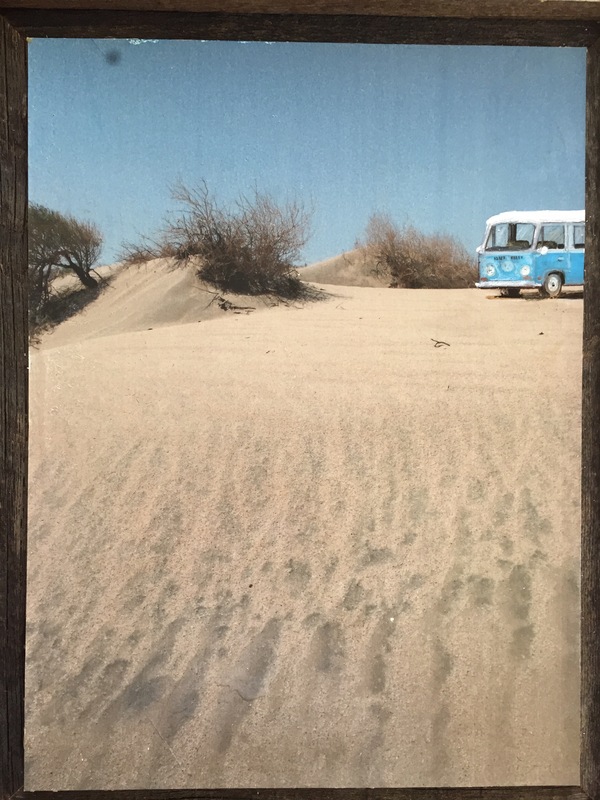 The Evocal surf art show, and TOM’S shoes, Art and Sole show at the the Light Gallery. 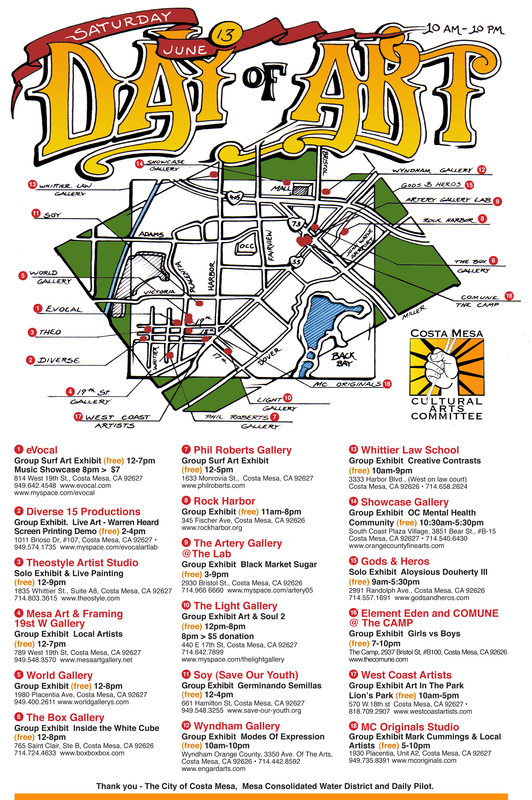 Check out the flyer and map of the area and be sure to cruise on by! Check out the booth we had at Sand Diego. We will be doing more events this summer so keep checking back for updates. Here are 2 more photos from the Elemental Experience down in SD. Thank you for all that came down to support the cause. Keep checking back, we are working on having an online store soon. Just bare with us. Mason putting on the finishing touches. 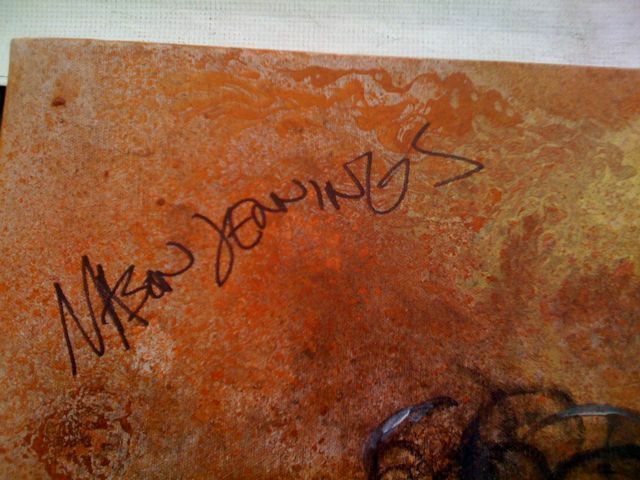 Signed by the man himself! 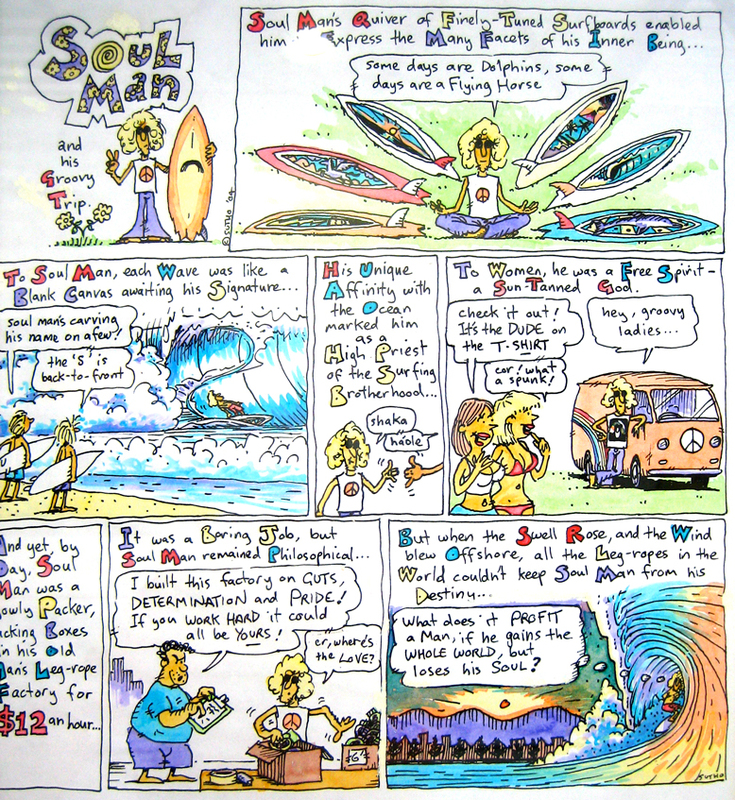 “Soul Man,” was one of two comics strips that were on display at the Santos Surf Art Festival, created by Mr. Mark Sutherland. I have always been into comic book art, animation and illustration, and after looking back on the photos of my Brasil trip, i am so stoked i took these photos. 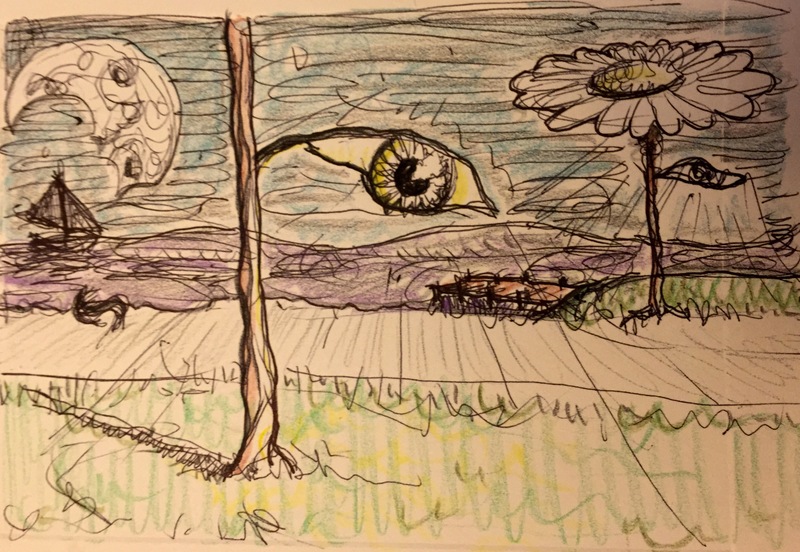 Inspired by Sutho, I have made it a personal goal of mine to create and illustrate my own stories. Thank you, Mark Sutherland for your inspiration and motivation.